In all lists about the largest gay pride events, the “Parada do Orgulho LGBT de São Paulo” always comes out on top: it is famous for having the largest gay pride festival in the world, with estimates of around 5 million people attending – simply incredible! Mexico City is a lot of fun, with a huge gay scene. It also has a large annual gay pride event taking place in June, which usually attracts around half a million people. One fun way to enjoy it is to tie it in with a visit to the very gay Puerto Vallarta. Puerto Vallarta is a beach resort city in Mexico’s Jalisco state, situated on the Pacific Ocean. It has a large LGBTQ community, with the majority of the city’s gay bars, nightclubs and hotels based in the charming cobblestone streets of the Zona Romántica neighbourhood. Just before the Mexico Pride in mid June, Puerto Vallarta has its own week long Pride festival with a mix of pool parties, boat parties, beach parties, a drag derby, the pride parade itself and many other festivities. It usually takes place in late May to coincide with the US Memorial Day weekend. For the most up to date information about both events check online resources and social media like Facebook. Buenos Aires is one of our favourite cities. We love the gay scene of Palermo as well as the rich tango culture in San Telmo including many queer tango “milongas” (tango dance halls). Not to mention the fact that the Porteño boys (local name for the people of BA) are simply smoking hot! The gay pride of BA is called the “Marcha del Orgullo a Pride” and takes place in November. Around 200,000 people attend to watch our Porteño gay sisters sashay their way around the streets of Argentina's big capital, starting from the famous “Casa Rosada” pink governmental palace – where Evita/Madonna famously sang “Don’t Cry For Me Argentina”. 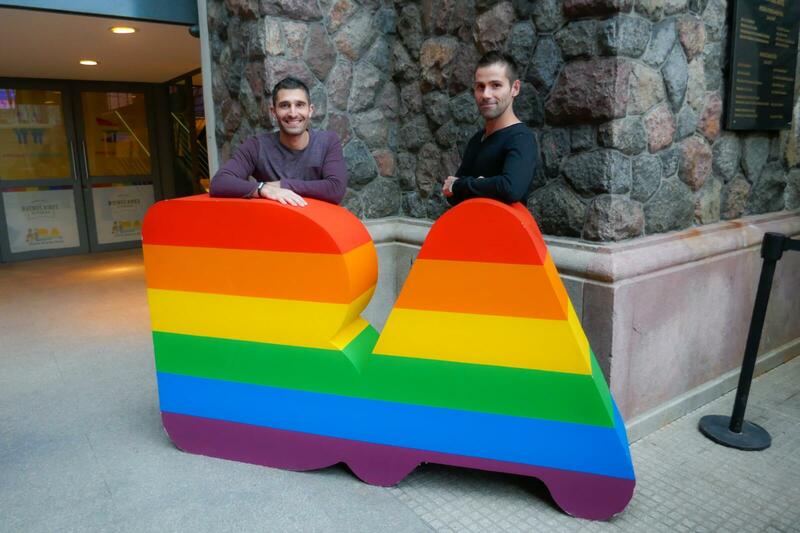 Read more about gay life in Argentina with our interview with Juan from Buenos Aires and why we think Argentina is one of the most gay friendly places in the world. Rio is of course famous for its Carnival street party in February. But did you know that the gay pride in June is the city's second biggest street party? Around 1 million people attend – similar in size to the gay prides of London, Cologne, Chicago and Columbus. 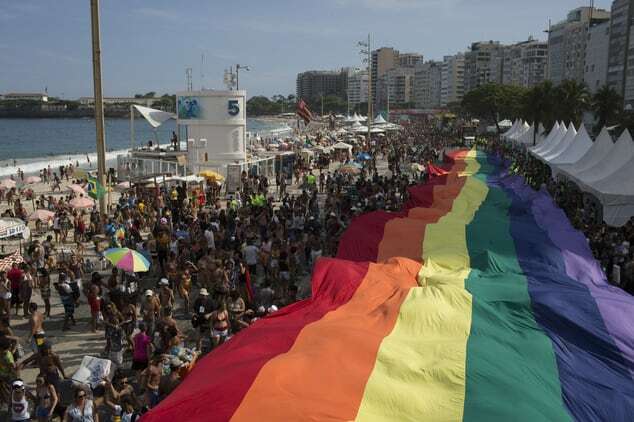 Yet unlike London, Cologne, Chicago and Columbus, Rio gay pride takes place on the beach. Think Tel Aviv gay pride, but much bigger. We also love it because the entire city embraces it, with smaller gay pride parades taking place elsewhere. In addition, unlike during the Carnival festival, hotel prices are not that high during the gay pride. Rio Pride usually takes place around September-November. It changes each year, largely due to funding problems. In 2017 it took place in November, and in 2018 in June it is rumoured to be in September. Check their Facebook page for the most up to date information. When Stefan first travelled to South America in 2005, Colombia was off limits. It was a dangerous place to travel and tourists were advised not to come here. When we visited in 2017, so much had changed. It's not only a much safer place, but it's also become one of the more gay friendly countries in Latin America. For example, in 2016 it legalised gay marriage, making it the 6th country in the Americas to do so after Canada (2005), Argentina (2010), Uruguay (2013), Brazil (2013) and the USA (2015). Most of the big cities in Colombia have their own gay scenes, particularly Bogota, Medellin and Cartagena, and they also have their own gay prides taking place in late June/early July. The largest is the “Orgullo Gay” of Bogota, with around 50,000 people gathering. Bogota Pride is one of our favourites because it has the best after party – at the famous “Theatron” – the largest gay club in South America. Theatron is a mega club complex with 13 clubs inside with around 5,000 people. It is one of the best gay parties we’ve ever been to in our travels and reason alone to visit Bogota. For the most up-to-date information about the next Bogota Pride, join their Facebook group and check their Facebook page. You can also read more about what it's like growing up gay in Colombia with our interview with Jesus from Barranquilla. Thanks Raf! Do you know if the Rio Pride date has been officially announced yet? Or are they still working on the date? Looks like some fun times guys. Betcha those parades in Brazil are something else. Those folks know how to party.